I was supposed to be baking and packing homemade edible gifts this month, but I am taking it slowly as time is a big constraint for me this month. Like I mentioned in my last post, my first batch of Kerala Plum cake was baked, but it didn't last for long. The cake was served during Christmas caroling. My kids and hubby asked me to bake another cake. I am planning to share some cookie recipes too. Meantime I want to share something simple that can be prepared in a jiffy, but it surely looks festive enough for the season. Yes it has the red and green color. But it’s not a dessert and it’s not restrained to X'Mas season, you can make it anytime when your tummy calls for it. Today's post is a simple Pulao/Pilaf. Basmati rice is cooked to grain perfection with a blend of whole spices and ghee. Then the aromatic rice is mixed with lightly seasoned vegetables cooked separately. I prefer cooking the vegetables separately to retain their shape and color rather than cooking along with the rice. 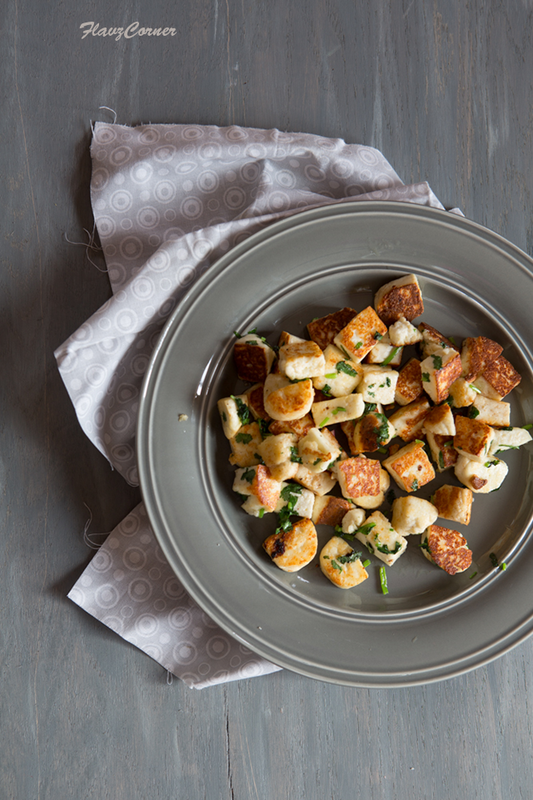 The star ingredient in this recipe is the paneer/Indian cottage cheese cut into cubes. I prefer homemade paneer as I like to season them while making it. It’s so easy to make paneer at home and I am sure once you start making it your own, you will like it. 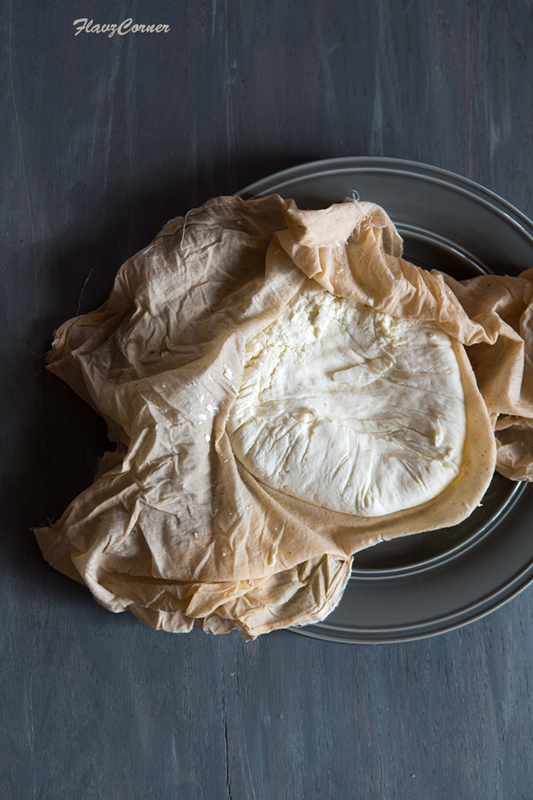 If you don't want to make paneer, you can very well buy it. I will post the homemade paneer recipe sometime soon as I didn't take enough pictures of paneer when I made it. Pictures matters to me…you know me…so I assure that I will do a separate post soon. Boiling method - Simply boil the washed rice with excess water and drain the excess water after the rice is cooked using a strainer. I use this method to make half a batch of rice when making Biriyani. You will lose starch content and any nutrition while following this method though. But you can get the perfect grains if you drain the water out when the rice is 95% cooked. Pressure Cooker method - It’s tricky to get non-sticky rice. Soaking time, cooking time and cooling time is very important in this method to get non-sticky rice. But it’s a very easy and quick method. Stove top pan method. In this method you cook the soaked rice with double the amount of rice - 1/2 cup of water in a non stick pan with the lid on and cook for 15-20 minutes till the water is completely absorbed by the rice. This is the fool proof method anyone can try. This method works perfectly for Pulao/Pilaf and it retains the flavor and texture of the rice. Soak Basmati rice in water for 20 minutes. After 20 minutes drain the water and keep the basmati rice aside. Take a big wide mouth non stick pan with a tight lid. Melt 1 tbsp of butter in the pan. Add the paneer pieces and fry till golden brown. If using store bought paneer sprinkle some salt over it. Transfer the paneer pieces into a plate. Now add 1/2 tsp of ginger garlic paste to the pan with the left over ghee/butter. Cook till raw smell is gone. Add the carrots and bell pepper; adjust the salt and cook on medium heat for 3 - 5 minutes. Add garam masla powder, pepper powder and cook for another minute. Finally add the green peas and toss well. Cook for a minute and turn off the flame. 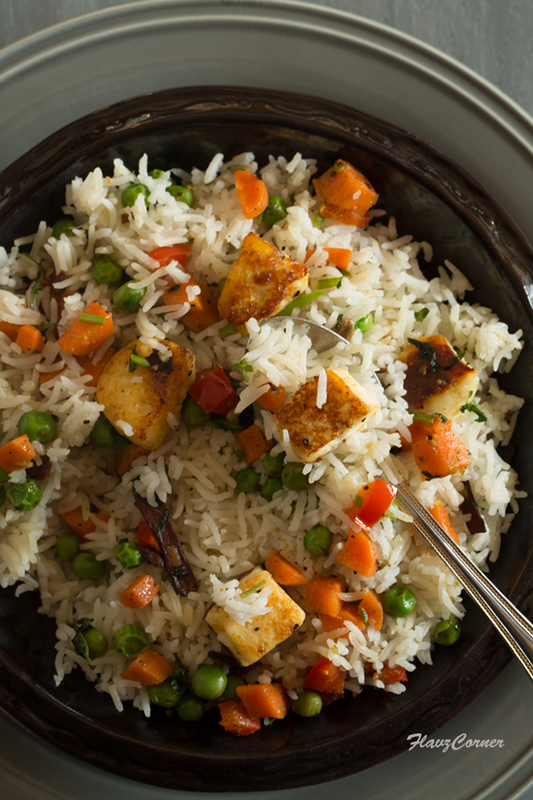 Add chopped cilantro to the veggie mix, stir well and transfer the veggie mix into the fried paneer plate. Melt 1 tbsp of ghee/butter in the same pan. Fry the whole spices for couple of minutes and add ginger garlic paste. Let it cook till the raw smell is gone. Add the soaked rice into the pan and fry for a minute. Add salt and 4 1/2 cup water. Adjust the salt at this step. Cook on high flame till the water comes to a rolling boil. Lower the flame to medium heat and cover the pan with the lid. Cook on medium heat for 10 minutes. Open the lid and give a stir. Lower the flame again and cover the lid. Cook for another 6-8 minutes till the water is completely absorbed by the rice or till rice is cooked completely. Turn off the flame and let the rice sit for 5 minutes. Use a fork to fluff the grains, they will not be sticking to each other. 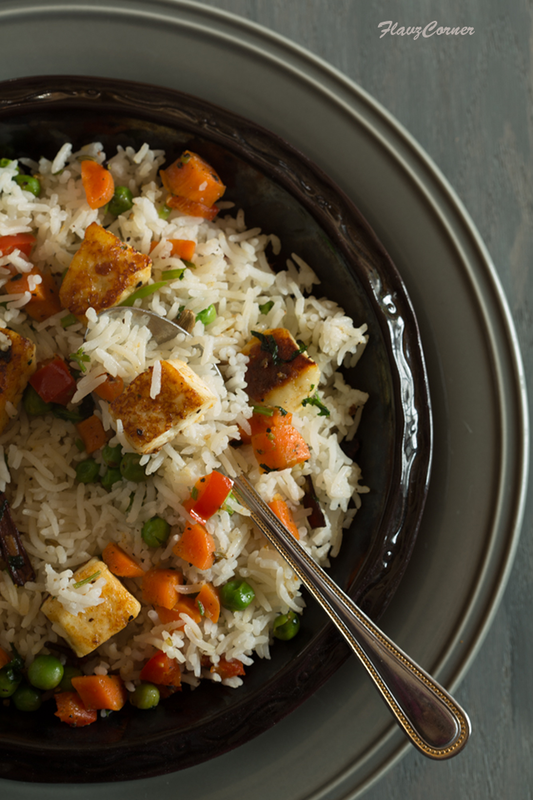 Add the paneer veggie mix to the rice and gently mix using a wooden spoon without breaking the rice grains. 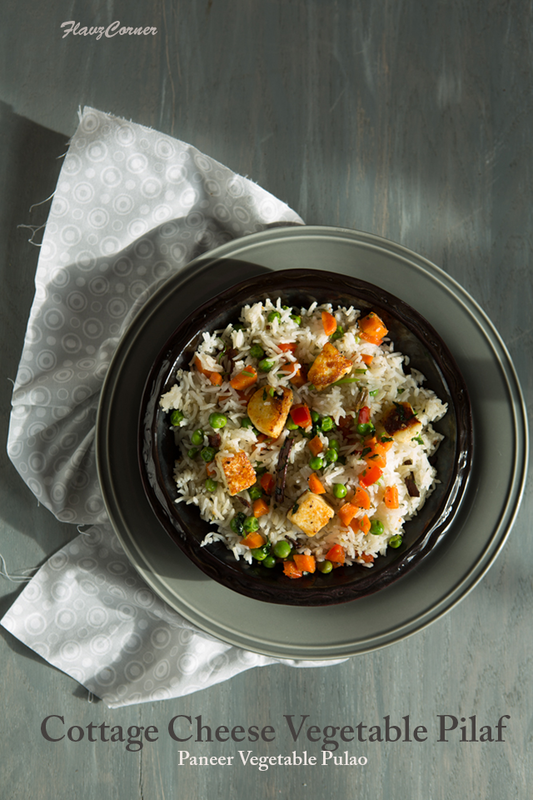 Garnish with chopped cilantro and enjoy the Pulao with your favorite curry. I absolutely love simple puloa like this any day. That cheese looks amazing, soft and perfect. Your cake ofcourse would've vanished, it's hard to resist. Enjoy your Holidays my friend and MERRY CHRISTMAS!! Such wonderfully delicious comfort food! This looks terrific -- thanks. And Happy Holidays! This looks so delicious! Homemade paneer...how cool is that!! Hello..visiting ur space after a long time.Hope u had a wonderful christams. I make Paneer pulav for my lunch box often. Had a look at ur previous post, superb pictures ! Any dish with rice is my dish, just love it! I am wishing you the best in new year. Many more creative ideas! Although I have not tried making pulav with paneer - it used to be one of my favorite fried rice dish from the the veg hotels in Bangalore... Makes me nostalgic...this looks so yumm!